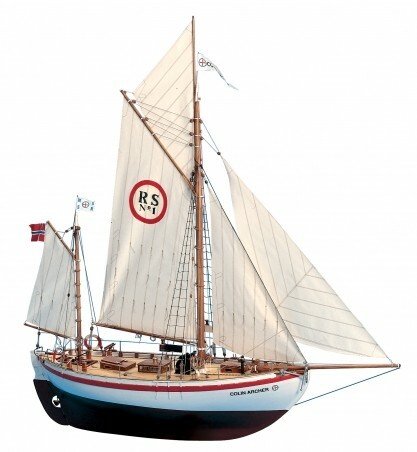 This is the recently re-released, larger kit version of the Colin Archer, suitable for RC. RS1 was built in 1893 for the “Norwegian Society for Shipwreck Salvage” at the Colin Archer shipyard in Rekkevig near Larvik, Norway. RS1 was later named “Colin Archer” after its designer and builder. The sharp-sterned design of the vessel has given it world-wide reknown. Roughly 30 boats of this type were built, most of them at the Colin Archer shipyard at Tollerodden in Larvik. RS1 Colin Archer has had an eventful past. After 40 years as a salvage vessel, the ship was sold in 1933 to private owners, who added a small auxiliary motor. It crossed the Atlantic in 1938, suffered severe storm damage in North Carolina in October 1954, and was found as a wreck on the Potomac River in 1960. After 23 years in the USA, the Colin Archer was returned to Norway in December of 1961 as deck cargo on the freighter “MS Tasco”. Then followed a series of owners - and both good and hard times. Finally, on 21 April 1972, the oldest salvage vessel in Norway was handed over to the Norwegian Maritime Museum in Oslo. In 1973, responsibility for the vessel was given to the Colin Archer Cutter Club, which has since completely restored the ship and sails it, in agreement with the Norwegian Maritime Museum, as a functioning reminder of the past. Today the Colin Archer is a welcome guest at vintage ship gatherings in Northern Europe. 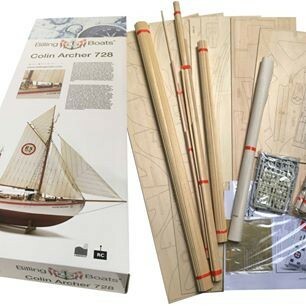 This is a plank-on-bulkhead kit that includes laser-cut wood for the main structural parts; wooden planking strips; fittings set with brass, wood and plastic parts; sail material, rigging line; plans sheet and manual. This is an EXPERT level kit, and should only be attempted by someone with adequate ship modeling experience. Recommended Paints: BB01, BB05, BB11, BB14, BB15, BB16, BB17, BB20, BB35, BB36, BB40 thinner/cleaner.